Challenge the assumption that women’s work should be performed for free and always with a smile. 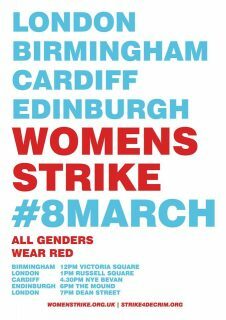 On 8 March women around the world are going on strike for the day; this is a call to action for women in the UK to join them. The Women’s Strike is an international strike being planned and organised by and for women in over 50 countries. One year ago, on International Women’s Day, women and their allies around the globe participated in the first International Women’s Strike, which was billed as “A Day Without a Woman.” Building on the international momentum from the Women’s March earlier in 2017, strikers took to the streets and demonstrated from Tokyo to Rome, Istanbul to Mexico City, Manila to Los Angeles. On 8 March 2018 women worldwide will refuse to work. We women will walk out of our kitchens, universities, brothels, schools, bedrooms, factories, hospitals and offices. We women will strike from all the work we do, whether it is paid or unpaid. We women will strike against the decades of neoliberal policies directed towards women working inside and outside of the home. Women will refuse to work. Women will be on the streets. And women will shut things down and disrupt business as usual. Women’s work makes life possible. And for that work, we are rewarded with violence and exploitation in the streets, at work and at home. The recent #metoo campaign has exposed the daily reality of sexual harassment and violence that is at the centre of our labour exploitation. To add insult to injury, we are told that our suffering is inevitable – even natural. Women strike to reject that lie. Women strike for a world where women can live free from violence and exploitation. The Women’s Strike will occur on International Women’s Day; join a new international women’s movement which has only grown in strength and determination since exploding onto the streets in recent years. From Argentina to Poland, from Ireland to Mexico, women are making connections, building alliances and taking action against the current conditions of womanhood. The Women’s Strike rejects the decades of economic inequality, criminalisation and policing, racial and sexual violence, and endless global war and terrorism. The Women’s Strike is a strike for solidarity between women – women of colour, indigenous, working class, disabled, migrant, Muslim, lesbian, queer and trans women. The Women’s Strike is about realising the power we already hold – activating and nourishing resistance. It bursts into the centre of politics. It produces collective solutions to our individual experiences. It breaks the age-old (fake) story of female weakness. The Women’s Strike is a challenge to the assumption that women’s work should be performed for free and always with a smile. And women demand that all women to have the right to choose when – and if – they want to have children and, at the same time, not be trapped waiting to be chosen. The Women’s Strike defies the idea that all women need to do is tell our stories and speak out. Women are exhausted from telling the same story, over and over again. Women need action.